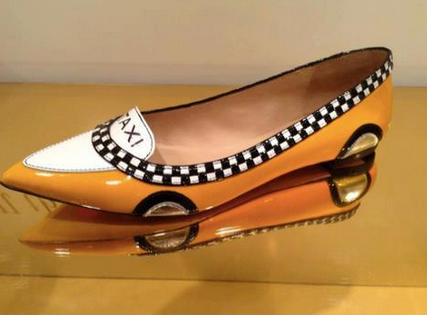 Drive a taxi? Manage a taxi fleet? Get listed on TaxiFareFinder! National Audience – Travelers, especially those from out-of-town, look to online resources to plan their trips. Think about it; they have no access to YOUR local newspaper or phonebook. 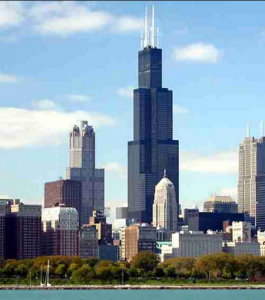 Whether they are visiting from the suburbs or from another city, TFF is always available. Trusted Resource – TaxiFareFinder is recommended by official tourist websites, such as Seattle.gov and SanDiego.org, worldly known guidebooks, such as Frommer’s and Insider’s Guide, and trustworthy media sources, such as USAToday and Wall Street Journal. #1 Website in Taxis – TaxiFareFinder is visited by over half a million potential taxi riders every month. Search engines rank us #1 for many taxi related keywords. Try typing, “taxi fare <your city>” in Google and see what happens. Acquire New Customers – Many travelers come to TFF because they are new to taxis in your area. Expand your loyal customer base by being the first to reach them. TaxiFareFinder is excited to announce the release of taxi fare calculators for eighteen cities in Australia. Although we already had a few Australian calculators before this, we are looking to expand our presence and continue to add new cities. Please let us know how these calculators perform: they are still in the early phases, so feedback is always welcomed! Taxi etiquette in Australia is a little different from that of the United States as well as many other countries. After hailing a cab in Australia, it is expected that you sit in the front seat next to the driver. If there are multiple passengers in a party, it is customary for the first rider to fill the passenger seat and the rest to then continue into the back seat. It is viewed as very impolite to sit in the back seat first and drivers see it as an indication of inequality. For more information on this, check out our article. 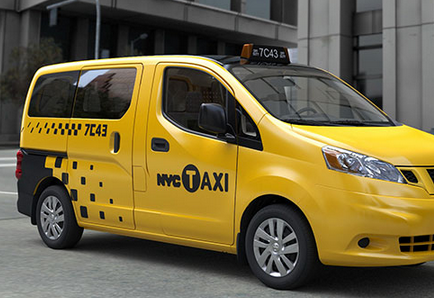 What is the vehicle brand of the new NYC ‘Taxi of Tomorrow’? Travels In A Cab is a truly unique blog written by a man with an obsession for cars with personality: in other words old, loved automobiles and especially his coveted New York City cab. 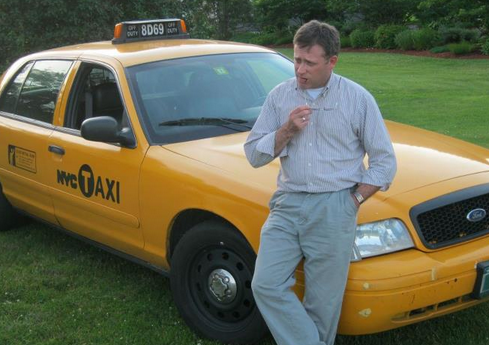 This blogger purchased a retired NYC cab and uses it to travel around the country. 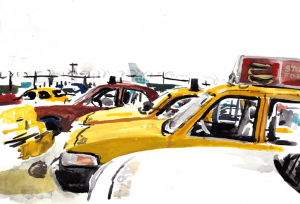 In each blog entry, he recounts the huge amount of publicity and attention received by his beloved, abandoned taxi in the various cities he visits. We are so pleased to have had the opportunity to learn more about the adventures had in this 2006 NYC taxi cab during our interview. 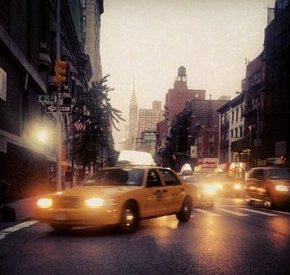 Your adventure is truly an unique one: you drive a traditional “NYC Taxi” outside of the city, all over the country. Where did you get this idea? I’ve always had an affinity for cars that no one else wants; I’ve had a stable of them. 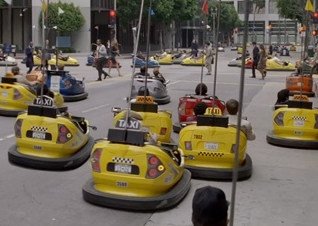 But for some reason, I’ve always thought of a NYC Taxi as the one vehicle that reigns supreme in the “cars that no one wants” department. They do not exist for very long when their service life is over, and accumulate an insane amount of mileage that any sane and financially intelligent person would stay far far far away from. When they are retired, dead tired and hated by most, I love them. 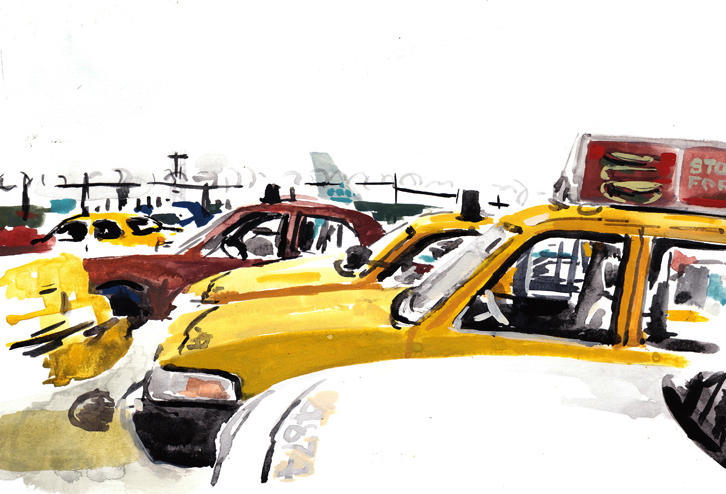 A NYC Taxi is unique, since it is an embodiment of the city’s landscape itself. So, instead of buying a coffee mug with a picture of a taxi on it, I bought a real one! Plus, few people know that the Crown Victoria in NYC had to be specifically made for taxi use, unlike used police cars in other cities. 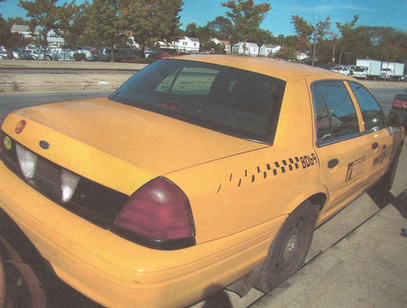 A NYC Taxi from 2002 on up, is actually a long wheelbase model meaning it is stretched for leg room. Therefore, the back doors on a NYC Taxi would not fit any other Crown Victoria, making the vehicle even more unique. I see. So how do you go about getting a real NYC taxicab…in case I want one? I bought my taxi by doing a search on craigslist.org: searching for a Crown Victoria with a price range of $200 to $1500 in the New York City area.. Occasionally I would find some real beaters listed on there. I bought mine private sale from a garage that I assume did the work on it while it was a cab; it was an extended owner operator, meaning it had been on the five year plan. Many of us, including myself, are wondering what the laws and regulations are surrounding driving a NYC taxi cab outside or even within its home city. Can anyone do this? In NYC, regulations state a yellow medallion taxi must start it’s service life new and can only remain on the streets for a period of three years, or five years if it is an owner operator cab, not a fleet garage. It is my understanding, that most of those taken out of service are either stripped for parts to keep others going, or sold wholesale to other cab companies in other cities. Many of these old cabs actually go to Chicago. I have not found a place where I am restricted from driving it around, especially because I am not operating it as a taxi. However, it would be too confusing and most likely some sort of violation, to drive around NYC with my taxi, as it is branded with the trademarked NYC logo. My hope is that twenty years from now, when none of these exist, someone will be glad I kept it in its original glory. It is in the same condition as the day it left the city, including the contents in the ashtrays and all! Do you ever get hailed when driving around in your cab? I actually never get serious hails. If I do, it is usually someone trying to be funny. Sometimes they yell out “Taxi!” as I drive by, although I’ve never in all my life seen anyone yell TAXI to actually get one! Hahaha, that’s great. You must get some interesting reactions. Can you share with us some of the most memorable encounters you’ve had while driving? I think the most attention my car has ever gotten was in Montreal, Canada. It was parked near the Notre Dame church and I was walking around. When I came back, there were crowds of people posing and taking pictures next to it. Then, later on at a stoplight, a group of fifty children on a school trip spotted my taxi while waiting for the walk signal. As if in choreographed unison, all eyes were locked onto the car and soon enough the cameras, waves and yells surrounded my cab! Also, when visiting Kennebunkport, Maine (home of President George W. Bush), my cab made the newspaper in full color after one of the Town Selectmen took a picture of it and made friendly inquiries about it. One time in Vermont, a Deputy Commissioner of the NYC Taxi and Limousine Commission followed me while he was here skiing. He loved that I saved the old cab and had his picture taken with it for his office. The car consistently gets photographed on the highway and people have been very friendly about it whenever I stopped someplace. You must meet people from New York who are familiar to NYC cabs. They must enjoy a little taste of home! In NYC, this car was one of 13,287 cabs and hardly revered. However, it is certainly funny how much a New Yorker likes a New York cab, when it’s not in New York. They love seeing this thing outside of the Big Apple; I think it makes them comfortable. There has only been one situation where a man from Brooklyn approached me and told me how weird it was that anyone would drive a NYC taxi. In a city of 9 million people, I guess I can’t tug at everyone’s heart strings. Also, I almost forgot, my girlfriend is Dominican and grew up in Harlem in NYC. She too is not a fan of my car and it doesn’t mean much to her other than the fact I love it. You know we are a Boston based company. 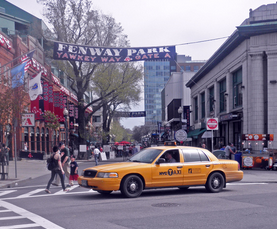 Did you visit Boston in your taxi and how did you like it? We are not so kind to NY people, you know. Oh yes, I wheeled into Boston and remarkably, it hardly even got a blink or wink. I roamed all over the place and even had it’s picture taken at the entrance to Yawkey Way. I was hoping a big brawl would ensue, but nothing! Like most places I take the old cab, I write a blog about it with pictures. I love Boston. Being a New Englander, everything is Boston in terms of sports anyways. 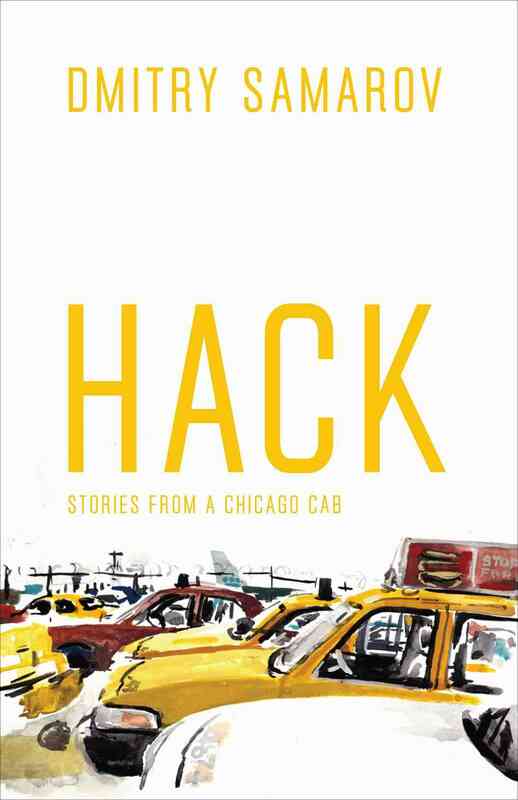 Actually, a few years ago two guys actually finagled a NYC Taxi to take to California and back, but I think they went off meter and haggled the driver down to $5,000 plus paying for his meals and hotel. They did it in a Ford Escape! What a trip that must have been. What are your future plans? 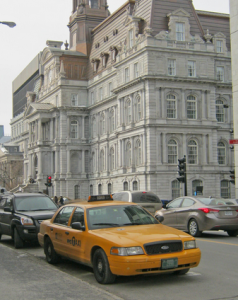 What about for your beloved taxicab? At the moment, my plans are keeping the thing going – it has 350,000 miles on it, hard miles. Things break consistently: my rear axle is on borrowed time, to name one. The next trip planned is to Washington D.C., followed by a trip to Ocean Boulevard in Miami Beach, Florida. We shall see! Thank you so much! Keep us posted of your adventures! At USA Today’s request, TaxiFareFinder calculated estimated one-mile, five-mile and ten-mile fares in the 60 largest U.S. metropolitan areas. All fare estimates are based on real rates and a mathematical algorithm, not solely on trip distance and duration. They exclude tolls and additional fees. It was discovered that fares in Honolulu, San Jose and San Francisco are among the highest. 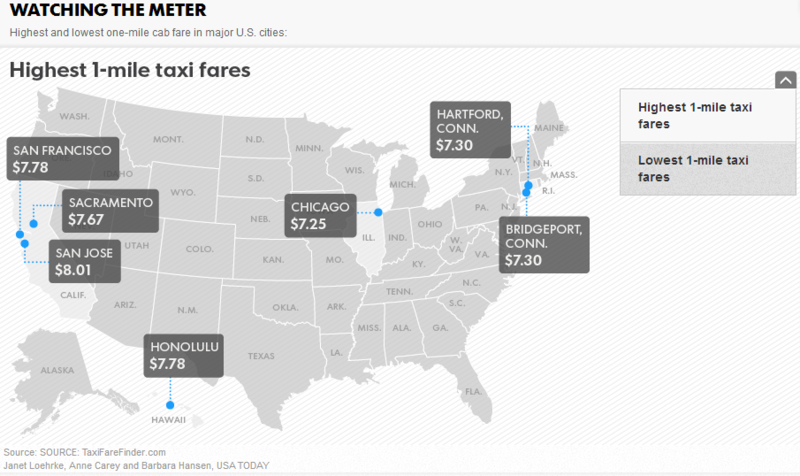 Fares in Detroit, Dallas and Pittsburgh are among the lowest. Check out the full article here! TaxiFareFinder is happy to release new taxi fare calculators for thirteen cities in Ireland. Whether you are a tourist or a native, you are now able to determine how much a cab will cost in these specific Irish cities. Please let us know how our calculators work out: they are still in the early phases, so feedback in encouraged and welcomed. Not many people realize that the Irish taxi industry operates a little different than that of other countries. The taxi rates for the entire country are capped by the central government. This means that individual taxi companies are free to set their own rates, but are unable to exceed the flag drop, per mile and wait time charges that are defined by government officials.